UPDATED With Comments From James Mangold: Is Hugh Jackman Hanging up his Claws? James Mangold, director of the upcoming Wolverine sequel, has confirmed via Twitter that Hugh Jackman will pop the claws for the last time in his film. “@RealHughJackman: WOLVERINE …ONE LAST TIME. HJ https://t.co/vlqMyFchGx” Can't wait to make this, HJ! Been toiling quietly a while now! Even though Hugh Jackman has said in the past that he’d love to play the Canadian mutant until the day he dies, we all know it had to end sometime. Hopeful Mangold crafts one hell of a send-off for the Ol’ Canucklehead. Could we be close to hearing Hugh Jackman’s final Snikt? 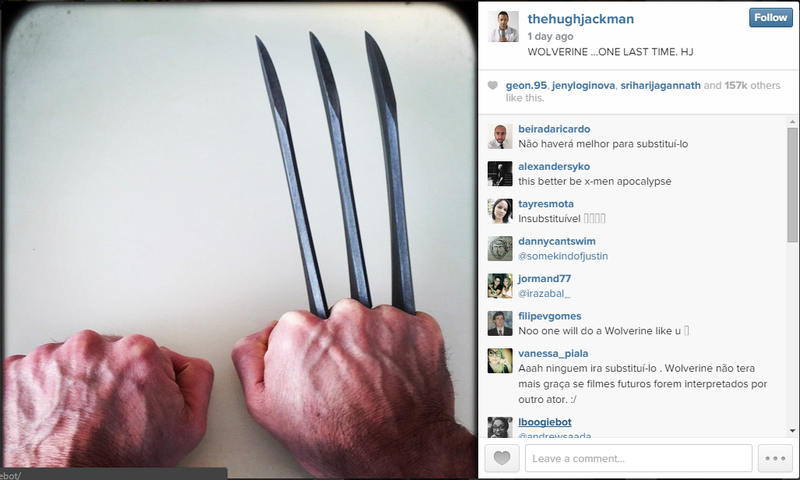 It would seem that Jackman is telling us that he’ll be sheathing his claws for the final time, possibly after the next Wolverine solo film. Hugh Jackman and Wolverine are pretty much one and the same to many people at this point. The actor has portrayed the Canadian destroyer in seven X-Men franchise films since they started in 2000 (including a quickie cameo in First Class, which was probably one of that movie’s funniest scenes). It’s hard to imagine anyone else portraying Logan at this point in time. With that being said, it’s not like the studio is going to allow one of the most popular mutants in Marvel’s roster to stop being used in films. It will be interesting to see where FOX goes with this. Do they pick another actor and hope that fans take to him? Or do they let director Bryan Singer manipulate the time/space continuum of the movie world again and somehow take care of Wolverine that way? Either way, we knew it had to happen eventually. Let’s just hope the fans are ready when Jackman says good-bye to popping those claws. This entry was posted in Breaking News, Film and tagged Hugh Jackman, Wolverine, x-men. Bookmark the permalink. Gillian Flynn and Steve McQueen Team Up for Heist Thriller!